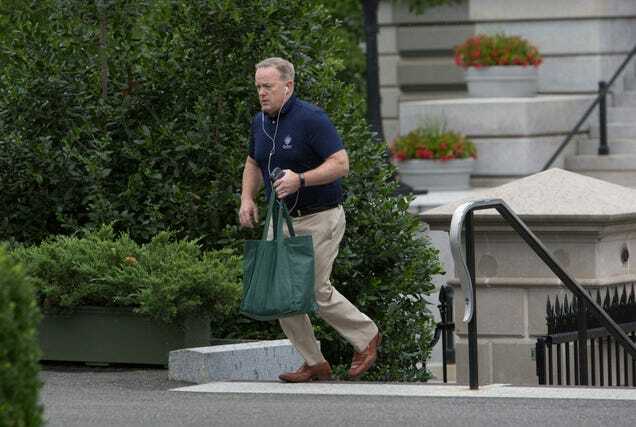 It’s been one month and one interim White House communications director since Sean Spicer resigned from his post as White House press secretary, but he’s just now getting around to bidding farewell to his old co-workers who almost certainly weren’t putting Jell-O molds in his desk drawers. Spicer’s final communique to the White House staff was true to his Easter Bunny-suited form: succinct, full of bowing and scraping to the president, and with one typo. But let’s face it, Spicer didn’t use any kind of spell or grammar check while he was being paid to utilize them to ensure the president’s message was always clear, so he wasn’t about to start on his last day. Still, he might have recovered from this latest gaffe if he hadn’t then misspelled Sarah Huckabee Sanders’ Twitter handle while sharing a picture of their good times (the @SarahSanders he did tag is someone who only posts Bible quotes, so maybe he was going somewhere with that). It just proves there was no other way for Sean Spicer to leave the White House than the way he came—in error.